Chances are there is a serious gap in your education. In this country, we are rarely taught how to use our bodies as effective, conscious communicators. Body Talk is designed to help remedy this situation- and it's plenty of fun, too! How do you say 'I love you' without opening your mouth? How do you signal concern to another person without using words or a facial expression? How would you show fear with your hands alone? It's a lot of fun to find out how you would do all these things - and an important education in the communicative possibilities of your physical being. Since scientific research has indicated that as much as 93% of the impact of what you communicate to others is conveyed by nonverbal means, it is a matter of some importance that you learn more specifically what these means are. 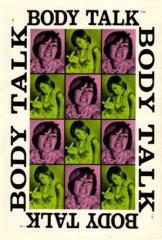 Body Talk is an experience in the nonverbal sharing of feelings. Here you can give yourself fully to an emotion, feel it in each muscle group, and let your body speak for you. Open all your senses to yourself and to those with you.